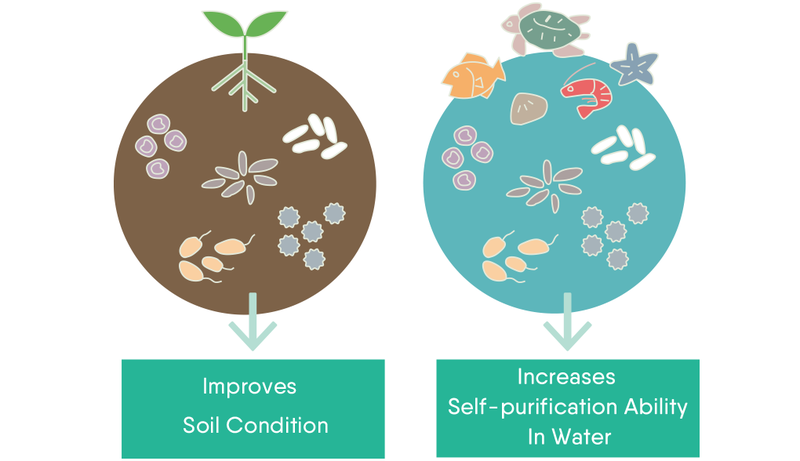 Healthy soil and clean water are maintained by the diversity and balance of the community of microorganisms within them. For example, when the balance of microorganisms in the soil is disrupted, soil will be impoverished and crops will not grow well. However, if native microorganisms are activated, soil conditions will improve. When the soil microbiology is in balance, plants will be healthy, thus more resistant to damage caused by stressors such as disease or harmful insects.In polluted rivers, species that cannot survive in a degraded environment die out and the ecosystem becomes degraded. Conversely, if the diversity of microorganisms is rich, nature’ s self-purifying ability is enhanced and clean water will return. The reason that EM can solve the problems it does is that EM restores a healthy balance of microorganisms in the ecosystem, thereby increasing its self-purification ability. In recent years, many researchers have been focusing less on the activity of single-strains of microorganisms and more on aggregates of microorganisms called microbiomes. In agriculture, it has become apparent that when soil microbiomes are healthy, they will enrich the soil. Healthy aquatic microbiomes will help maintain the environmental purification capabilities of rivers and other bodies of water.Microbiome studies have shown that quadrillions of microorganisms live within and on the human body and that these microorganisms make a significant difference to human health. Many of them live in the human gut and affect not only people’ s physical health, but also their mental condition. EM, which treats microorganisms as aggregates, was developed long before microbiome science caught the world’ s attention and its effectiveness has been demonstrated for three decades across the globe on fields in tropical and cold temperate regions. The beneficial effects of EM is produced when the groups of microorganisms in EM・1, including lactic acid bacteria, yeast and phototrophic bacteria, activate native microorganisms in the environment and harness their intrinsic power.